A new study indicates that warming temperatures caused by climate change may be releasing heat-trapping methane from layers of gas and oil that’s been lurking beneath the Arctic permafrost for thousands of years. Until now, anyway. 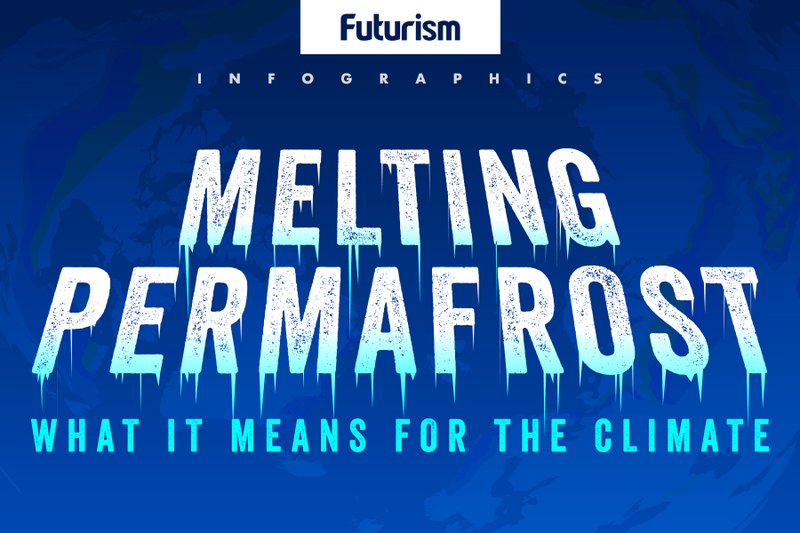 As the permafrost melts, millions of tiny openings are created, and some of these greenhouse gases rise to the surface, escaping into the atmosphere. Scientists sampled air in different parts of the atmosphere to detect sources of methane emerging from beneath the permafrost in northwestern Canada along the Mackenzie River Delta. The 10,000 square-kilometer area has long been known to have gas and oil deposits. Their findings indicate that pockets in the permafrost that have deeply thawed are responsible for 17 percent of all measured methane in the region. What’s more staggering is that these hotspots for emissions comprise just 1 percent of the permafrost’s surface area. Bacterial decomposition is commonly found in permafrost, and typically causes peak concentrations of methane emissions that are far lower than those seen in this case — which were about 13 times higher than average. This higher level of emissions indicates that there are also geological sources of the methane, such as gas and oil. The scientists concluded that global warming will continue to open new pathways for greenhouse gas emissions as it causes the permafrost to thaw, which in turn feeds the carbon-climate feedback loop. Previous research in Alaska had focused on single sources of deep methane. Findings from 2012 came to similar conclusions as researchers reached in the more recent case; although, those findings were based on areas around melting glaciers and along the edges of permafrost areas. All these findings prove that, over time, the loss of glaciers and permafrost can cause greenhouse gases to be released into the atmosphere. Furthermore, complete melting isn’t needed for those gases to be released. The Arctic is only going to be releasing greenhouse gases faster and faster as it shrinks to record-breaking low levels. The U.S. Geological Survey estimates that 16 to 24 percent of the permafrost area in Alaska alone will melt by 2100. Greenland’s ice caps have also passed the point of no return. New lows in Arctic sea ice levels reported by NASA are causing endangerment of various species of plants and animals. The story is the same in Antarctica, where ice shelves are shrinking at record-breaking rates. As the Antarctic ice sheet breaks down from the inside, it contributes to rising sea levels around the world. In fact, the Antarctic ice sheet has never been smaller than it is at present. It’s not yet clear how rapidly climate change will trigger methane releases, or in what amounts greenhouse gases will invade the atmosphere. Scientists are also concerned that melting permafrost may lead to the revival of viruses that haven’t been active for thousands of years. Experts around the world are issuing dire warnings, making it clear that the planet we know and love will not be the same if we don’t act now.